Tim Becker, husband to Caroline and father to Luke (9 yrs), Samuel (7 yrs) , and Hosanna (5 yrs), died suddenly at 12:15pm on Saturday September 22, 2018 at the Hospital of the University of Pennsylvania (HUP) from sepsis related to complications from an appendectomy done 5 years ago. He began to feel sick on Wednesday, by Thursday night was admitted to the hospital and died less than 36 hours later after his organs shut down, unable to withstand the spread of infection. Tim also leaves behind devastated and grieving parents, Rev. 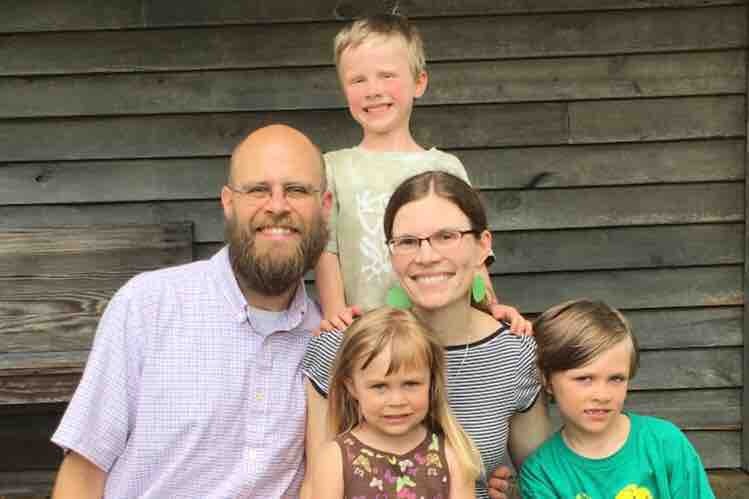 Bruce and Mary Becker, and siblings Jake (with wife Jessica and children Caleb and Maggie), Peter (with wife Julia), Erinrose (with son Mathias) and Rey. In these early stages of sudden grief, there is no way for Caroline to know what their concrete needs will be as she begins life as a single mother of 3, However, as their community, we know the needs will be there, and we wanted to establish a way for their community to stand in the gap for Caroline and the kids in a concrete, financial way. Caroline works full time at Esperanza Health Center as a Project Coordinator and Credentialing Manager, Luke, Samuel, and Hosanna attend The City School , where Tim's brother Jake is Head of School, and the family attends St. George Orthodox Church , where Tim taught the high school Sunday school class. Caroline will be able to make use of the money raised here in whatever way she needs, whether it's funeral/burial costs, mortgage payments, education fund for the kids, travel to be with family and friends, memorial contributions in Tim's honor, etc. She is a frugal spender so have no doubt your contributions will be well spent. If this is a way in which you would like to show your love and support for Caroline and the kids, please do give as you are able. This of course is only one way of showing your love and support, so please do not feel pressured in any way to give, it's just an option available for those would like to help in this particular way.